PRIVATE COLLECTION OF DISNEY COLLECTIBLES BEING LIQUIDATED. Shipping Instructions: Packing and handling of purchased lots is done by MILLARD AUCTION COMPANY, LLC,. All items must have shipping insurance; this insurance is mandatory. We will arrange for packing and shipping at our earliest possible convenience. We will attempt to ship as soon as possible, however, due to our high volume of absentee bids shipping can take up to TWO WEEKS after full payment is received. BUYER IS RESPONSIBLE FOR ALL SHIPPING, PACKING MATERIALS AND INSURANCE CHARGES. Please take in consideration the amount of lots to be packaged and mailed. Thank you! Checkout Date & Times: ITEMS MAY BE PICKED UP THE MONDAY AFTER THE AUCTION. 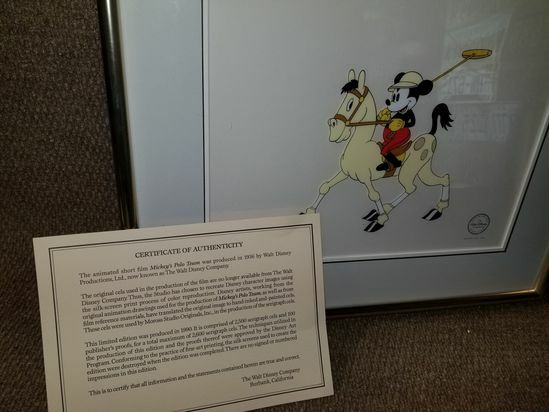 Serigraph Cel Certified "Mickey's Polo Team" produced in 1990. Serigraph cel certified Mickey Mouse & Minnie "The Mail Pilot"
Serigraph cel 'Cal Arts'. "Created exclusively for memebers of the Walt Disney Company Team"
Mickey's Orphans - 1931. Produced a limited edition of 7500 in 1994. You've been outbid to n****w! to YOU! You've been outbid to 2****6! to YOU! Three Mickey Collectibles: 1933 Worlds Fair Pocket Knife, Mickey Bowl, "Two Gun Mickey"